2 users have reported that they have successfully carried out the experiment using this protocol. Sharma, N. (2017). Leaf Clearing Protocol to Observe Stomata and Other Cells on Leaf Surface. Bio-protocol Bio101: e2538. DOI: 10.21769/BioProtoc.2538. In this protocol, leaves are cleared and fixed in an ethanol and acetic acid solution, and mounted in Hoyer’s solution. The cleared leaves are imaged under differential interference contrast (DIC) microscope. This protocol is beneficial for studying stomata, hair cells, and other epidermal cells in plants. There are multiple ways to observe stomata and other epidermal cells such as hair cells on plant leaf surface. Traditionally a clear nail polish or wood glue is applied to the leaf surface and let dry. The leaf is peeled and observed under the microscope. Alternatively, scotch tape is applied to the leaf and removed to observe an imprint of the leaf surface. These traditional methods can be used for thicker leaves that are sturdy but the images are generally not of the highest quality. Small and delicate leaves such as Arabidopsis leaves require a more advanced method. A fresh Arabidopsis or Brachypodium leaf may also be observed directly under the microscope; however, the thickness and pigments in the leaf pose difficulties in viewing the stomata and other epidermal cells clearly. This protocol describes a method clearing of leaves for visualizing stomata including other epidermal cells and obtaining good quality images for publishing in peer-reviewed journals (Anderson, 1954). Note: You may cut the Brachypodium leaf into 1 cm pieces to fit into wells. Note: Sterile is not required. Note: Calculate Standard Deviation in MS Excel. Fill multi-well culture plate wells with 500 μl-1 ml clearing solution (work in a fume hood to avoid the smell of acetic acid, see Recipes). Place the whole seedling or a leaf (about 1 cm) in the clearing solution and seal the plate with Parafilm (Figure 1). Leave the tissue in clearing solution overnight at room temperature. Younger seedlings (2-4 d old) only need a few hours to clear. For bigger leaves (6 d old or more), change the clearing solution every 4 h until the leaves become transparent (for faster clearing, otherwise overnight incubation is fine). You may keep the leaves in clearing solution for about a week. Figure 1. Leaf clearing and fixing. The ethanol:acetic acid solution fixes the tissue and the tissue becomes transparent. 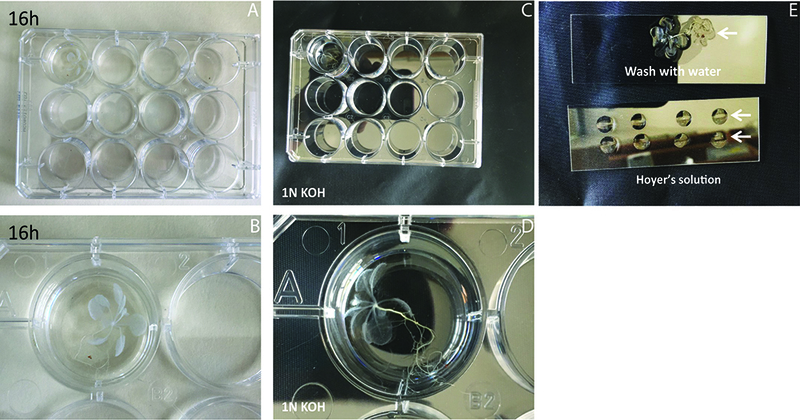 Remove the clearing solution and refill the wells with 500 μl-1 ml 1 N KOH (see Recipes) until the tissue becomes transparent (Figures 2C-2D). Note: Usually takes 30 min, you may leave them longer (5-6 h) in 1 N KOH but overnight incubation is not advised. Remove 1 N KOH and refill the wells with 500 μl-1 ml water to wash the cleared leaves (one wash is enough) and remove excess KOH. Take a clean microscope slide and place 2 rows of Hoyer’s solution (see Recipes) drops (~10 μl each for Arabidopsis cotyledons). You may put 4-6 drops per row. Thicker leaves require more Hoyer’s solution (Figure 2E). Figure 2. Washing the tissue. Cleared tissue (A, B) is washed in 1 N KOH (C, D). Tissue is washed in water (E, top slide) and placed in Hoyer’s solution (E, bottom slide). Place the seedling on a cover slide and dissect out the cleared leaves (you may use magnifying glasses), so that you have at least 2 leaves (cotyledons or true leaves) and hold them with abaxial side up using forceps (Figure 3). Figure 3. Slide preparation. Individual leaves form a precipitate when they are placed in Hoyer’s solution. Place the leaves in Hoyer’s solution droplets (Figure 3). Note: KOH reacts with Hoyer’s solution to form a precipitate that can guide you to place one leaf in each droplet. The precipitate will dissolve away quickly for young seedlings and may require more time for larger leaves. Repeat the above steps for 3-4 seedlings per slide. Gently place coverslip and press to flatten the leaf for better visualization (Figure 3). Leave the slides to dry overnight at room temperature. You may image the young seedlings in 3-4 h but longer drying is advised for bigger leaves (1-5 days). Apply additional Hoyer’s solution on the edges of the coverslip to fill any air bubbles formed during drying period. Image your cleared seedling under a microscope with DIC filter and document the phenotype (Figure 4). Figure 4. Same leaf imaged with Brightfield or DIC filters. DIC image (B) gives better resolution than Brightfield (A) to observe different cell types. Arrows: stomata (young and mature). Average X and Y values respectively. Calculate standard deviation (Calculate Standard Deviation in MS Excel) and standard error (standard deviation/ ) for each cell type and plot in a graph. Figure 5. Quantification of stomata. 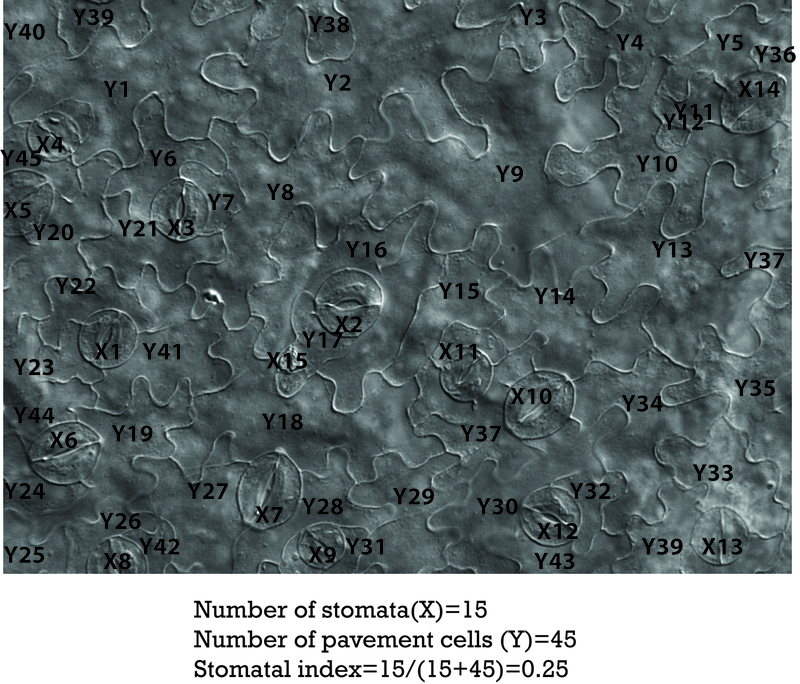 Number of stomata (X) and pavement cells (Y) are counted to calculate stomatal index. Note: The dissolution of KOH in water is exothermic, hence the solution will get warmer and it is important to add KOH slowly. Store the solution at room temperature for about a year. Pellets appear after long storage but they do not cause any problems in tissue preparation or imaging. I would like to thank Dr. Dominique Bergmann and her lab members for fine-tuning and implementing this protocol in their publications. I sincerely thank Graham Dow for providing the initial protocol. Anderson, L. E. (1954). Hoyer’s solution as a rapid permanent mounting medium for bryophytes. Bryologist 57(3): 242-244. How to cite: Sharma, N. (2017). Leaf Clearing Protocol to Observe Stomata and Other Cells on Leaf Surface. Bio-protocol Bio101: e2538. DOI: 10.21769/BioProtoc.2538. I would like to investigate stomata of conifers. I found your protocol and think it could be appropriate to prepare the neddles. Maybe you have some experience with this or you know from other researchers that succeeded in the application of your protocol to conifer needles? Thanks for contacting me about the protocol. Unfortunately, I have not tried clearing pine needles. The morphology of pine needles might make it harder to visualize stomata unlike Arabidopsis leaves. I would suggest trying out the protocol because clearing of the tissue would work in my opinion. I only foresee problems in visualizing stomata. Please let me know how it works out! thank you very much for your answer! I let you know, if we try the protocol and how it works with the visualization of the Stomata.